At California’s Fairview Gardens and around the country, spring brings a bountiful crop of asaragus. Fifty years ago, the rich seaside plains west of Goleta, 10 miles outside Santa Barbara, were covered with farm fields, orange and avocado groves. Today, much of the surrounding landscape has been paved or built upon. But a 12-acre oasis remains. Established in 1895, Fairview Gardens is one of California’s oldest organic farms and serves as a reminder of the way things were and an example of what’s still possible. And what emerges from Fairview’s rich soil each spring? 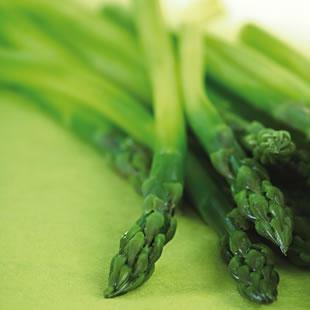 Acres of lush asparagus beds produce thick, firm stalks with an aroma that makes you want to eat them raw. The crisp, fresh spears break with a snap, and the buttery taste is succulent and delicious. Fairview farmers bundle the spears for sale at their on-site farmstand and community farmers’ markets, where the asparagus doesn’t last long—customers come from as far as San Francisco, more than 300 miles north. Growing asparagus is a commitment; with a harvest season of just eight to nine weeks, the plants occupy soil space all year, gathering and storing nutrients. Fairview’s executive director Mark Tollefson says consumers should demand that their local farmers raise these kinds of long-term vegetables, even though it’s not as profitable as quicker-growing crops like lettuce. Asparagus explodes with flavor and goodness, and it is a celebration of a new season.